The GC-2014 is a trend-setter offering both world-class performance for both capillary and packed GC applications. The Advanced Flow Control (AFC) results in superior reproducibility in retention times and peak areas. The detectors have been completely redesigned, incorporating advanced features for providing maximum sensitivity. All detectors used in Gas Chromatography such as Flame Ionization Detector (FID), Thermal Conductivity Detector (TCD), Electron Capture Detector (ECD), Flame Photometric Detector (FPD), Flame Thermionic Detector (FTD) are offered along with GC-2014 to meet diverse range of applications. 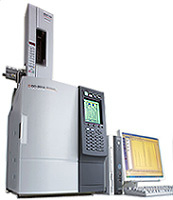 A full line of Injection Units such as Dual Packed Injection Unit, Split/Splitless Injection Unit, Direct Injectiion Unit expand the range of samples that can be analyzed using GC-2014. A large LCD displays chromatograms and method parameters on the instrument and the graphical popup screen clearly guides operation .